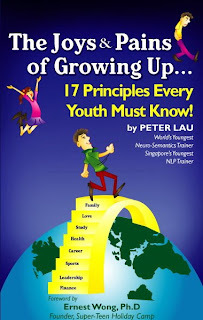 Peter Lau's Blog: HUGE Announcement--"The Joys & Pains of Growing Up" to hit Bookshelves by 30th Oct'08!!! HUGE Announcement--"The Joys & Pains of Growing Up" to hit Bookshelves by 30th Oct'08!!! Ladies and Gentlemen, boys and girls, children of all ages, I am extremely excited to announce that my book, "The Joys & Pains of Growing Up: 17 Principles Every Youth Must Know! ", will hit the shelves of major bookstores in Singapore by 30th Oct 2008!!! The estimated date of the book hitting the bookshelves will be the 29th or 30th Oct. I will update you on this again. I have also added a little countdown clock (on the right) to countdown to the date of release. If you truly want to succeed early, this book is specially written for you! Go get this book and YOUR LIFE WILL NEVER, EEEEEEEE................. EEE..................EEVER, BE THE SAME AGAIN!! !